My birthday is on the 1st August and I have 1 brother and 1 sister. My favourite game is playing with dolls. In Ntwetwe life is hard for children like me. But sponsor me today and you can change my world for good. 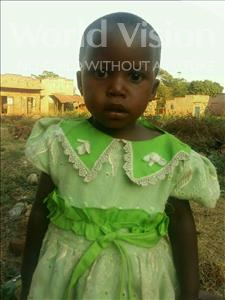 Judith lives in Ntwetwe, Uganda. By sponsoring her, you can help her whole community, to make it a better place for children. For children like Judith, growing up in Ntwetwe, malnutrition, illness and death from disease are everyday realities. Children who attend school aren’t able to learn because their teachers are poorly trained. Many children don’t know about their rights and live in fear of abuse. Your sponsorship can change Judith's world, and her community, for good.